As part of our Real Estate Career Services, Moseley students and alumni enjoy unlimited career counseling and assistance from our Student Services Specialists. Contact a Moseley Student Services Specialist at 1.877.Moseley (1.877.667.3539) during normal business hours for assistance with initial job placement, relocation, and regulatory/licensing issues. Moseley’s growing family of Community-Centered Education Program facilities ensures that Moseley programs are consistently delivered at a classroom location near you. Our Community-Centered Education Program also means that Moseley students enjoy VIP access to career opportunities at the best firms of all sizes. 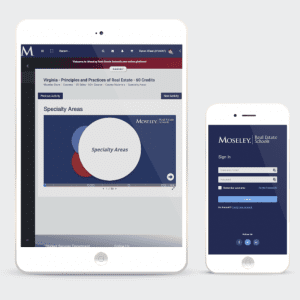 Contact a Moseley Student Services Specialist at 1.877.Moseley (1.877.667.3539) and let us help you connect with a firm that is right for you. Browse our firm listings for a location near you.